This isn't a review post but rather a curious cry for help. 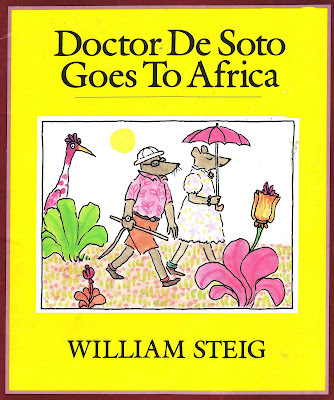 A few years back, I purchased a paperback copy of the wonderful sequel Doctor DeSoto Goes to Africa by William Steig from a used book shop. I was delighted to find that the book was signed on the inside cover, but then never thought of it again. The other day my son selected it from his bookshelf for a read, and I noticed the signature again. Upon closer examination, the signature looks almost printed in the book. I started Googling used paperback versions of this book, and it seems a good deal of them are being sold as "signed" as well. I found one seller on eBay who had scanned the signature... and it is exactly like mine. I mean, exactly, as in photocopy exactly, which seems highly unlikely. Does anyone have any info on this? I'm beginning to suspect Steig had this printed on the front cover just to mess with people. If it was a lavish joke, it fooled me! And if it is in fact a signature, then Steig was some kind of genius savant with his penmanship. Either way, it has sure given me a tickle this morning. I don't have info on this specific book, but I have seen this in other books - namely William Joyce's 'bently and egg'. I thought I had nabbed a signed copy, but then I discovered that many books had the exact same signature...it's a curious thing and I'd love to know the answer! Speaking of eggs - I believe you've mentioned that your son has a fascination with birds. I wonder if you've heard of a book called 'An Egg is Quiet'? It's very new and so definitely not 'vintage', but it's a lovely book nonetheless. It's also not strictly about birds as many different types of eggs are featured. In any event I do highly recommend it to you! We've been having a HUGE amount of fun with it! I have several copies of this Steig book and all of them have his signature. I think I purchased them through Scholastic. I have other books I purchased through Scholastic which have fake signatures such as Jan Brett. In my classroom, I ordered from Trumpet Club for years. They often sell books with "signatures" inside the front cover--and I've seen some for sale at bookstores marked as "signed by author," though it's actually printed in there. Bummer. I have other paperbacks (I can recall one of Rosemary Wells, though I can't remember which book) that appear to be signed but I took it to be a photocopy. It's a cute idea. I understand why the publisher did it as it personalizes the book (and I personally like seeing what author signatures look like)... but goodness, I'd hate to think how may people have overpaid for a used paperback thinking it was signed. I wonder if the publisher had figured readers would mistake the printed signature for real when they would buy the book? If so, shame on them. It is a cute idea, and a part of me really does like in, but the other part of me thinks it's also misrepresenting the work. Hmmm. That does look like a lovely book. I'll have to pick it up at the library. Thanks Chandra! "Sara, have fun, and keep on writing - Bernard Wiseman"
Sort of things. Flat signed ones are pretty rare (and sometimes on a stick-on plate). It is a great joy when you find one though! I've yet to run across a Mercer Mayer one... crub. I'm glad you brought this up. I thought it was odd to see so many signed copies come up on ebay. I thought maybe he did some serious book tour for that one, but they wouldn't be scholastic in that case, and he was 85 when he wrote that one! I've almost bid on signed copies before but luckily, and coincidentally, I just found a first edition hardcover this past weekend for 99cents. Last year, I found a copy of Gorey's Gashlycrumb Tinies at a thrift store and it has a signed bookplate, or at least I think it does. The ink seems shiny and not printed and the signature matches others I've seen online. Not sure how to be sure. gorey was a prolific book signer and used to sign book plates a lot as he got older, so that's probably the real thing.